← To Race or Not to Race? Grete’s Great Norwegian Gallop gives runners the opportunity to tread in the footsteps of perhaps the greatest female distance runner ever. Grete Waitz rewrote the history books for the women’s marathon bringing the record down from 2:34:47 to 2:25:29 – and proved that women could do just as well as men. 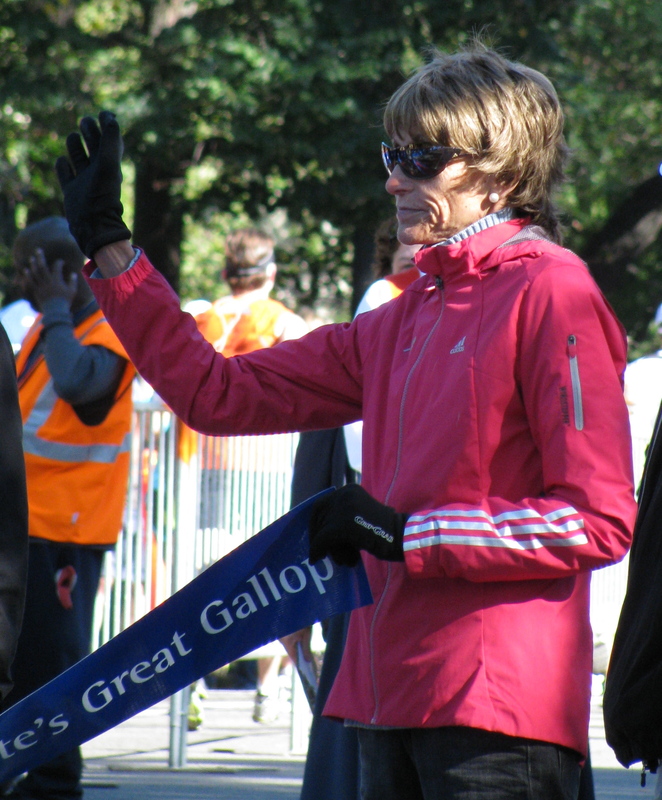 She won the New York City Marathon (NYCM) a record nine times between 1978 and 1988. Sadly she passed away last year, a victim of cancer. Grete at the finish line in 2010. She was always there at the start and finish of this race. This year almost 6,000 lined up to run. Low 60s F, overcast with a light wind made for perfect race conditions. In the starting corral I met some rival masters runners from Urban Athletics. We discussed the merits of shaving the morning of the race. I always go for the clean cut look: they’d all opted for the primeval look. Maybe I secretly hoped to shave a few seconds off my time. 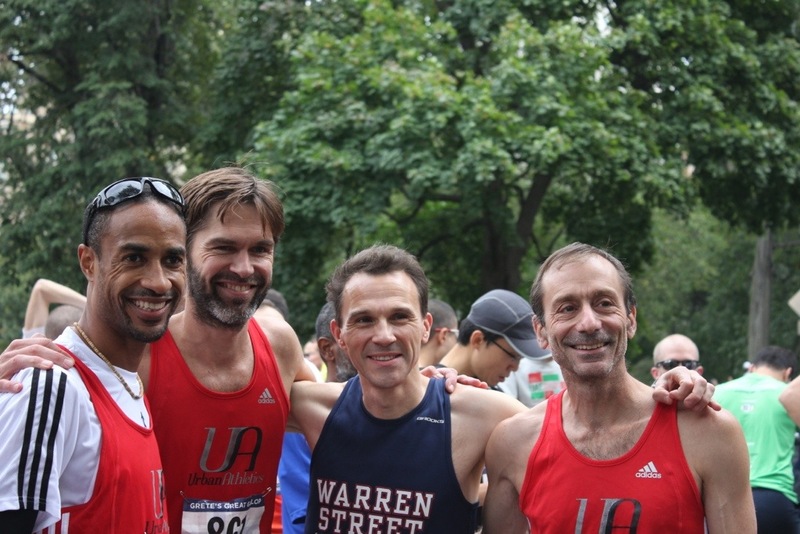 Hanging out with the Urban Athletics runners at the start. My expectations for the race ran high. Training had been going well so I hoped to duck under 1:12 and if possible 1:11:20, the fastest time for a British athlete in the M45-49 age group for 2012. The key was to find a good group, or two, and share the work. The course was the full loop of the park, twice, plus a mile through to the finish at Tavern on the Green, where the NYCM ends. I set off conservatively, settling into around 20th place and passed the first mile in 5:30. I then steadily stepped on the gas. It was one of those rare occasions where I felt confident of being able to push harder and sustain it. One by one I picked off the athletes in front and edged into the top 10. Passing 6 miles in 32:40 I found myself caught by Central Park Track Club (CPTC) runners Matthew Lacey and T Patrick Hynes. They were running a fraction faster so I hitched a ride. With a little drafting I got over the northern hills and past 10 miles in 54:09, faster than my recent Bronx 10-Mile clocking. Coming down Cat Hill with some of the CTPC runners. We started lapping a large number of slower runners. This made for a kind of slalom as I dodged runners and pedestrians in the closing miles. I crossed the line, legs wobbling, in 1:11:15, good enough for 7th place, the highest age grade (90.9%), and first masters. 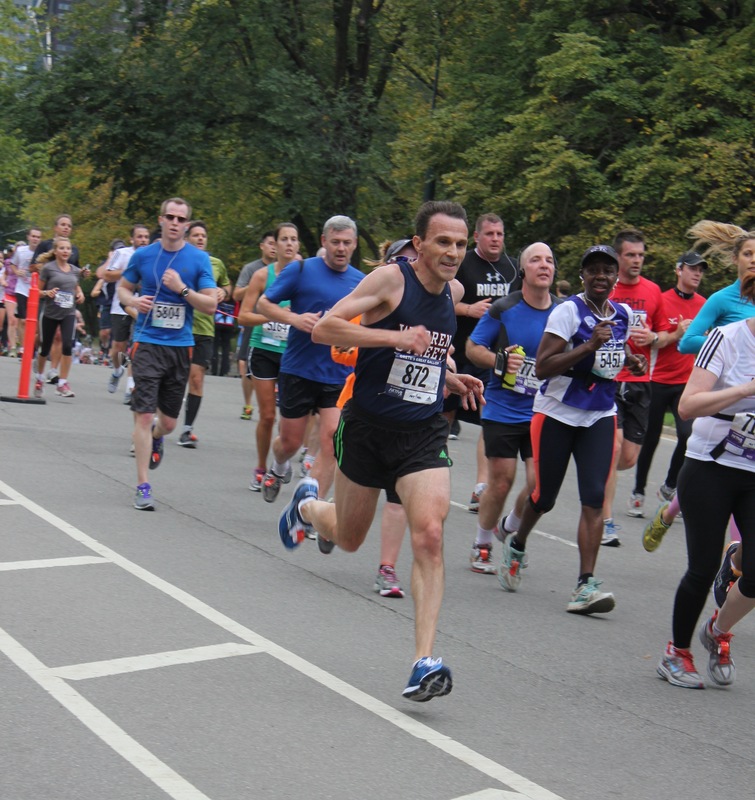 Heading for the finish line – clearly I’m a heel striker. It proved a good day for Warren Street’s master’s mens team of Peter Heimgartner, Jeremy Johnson and I. It was our first victory of the year, beating Urban Athletics who’d won every other club scored race in 2012. Post race I decided to substitute a warm down for a bagel with Norwegian salmon. 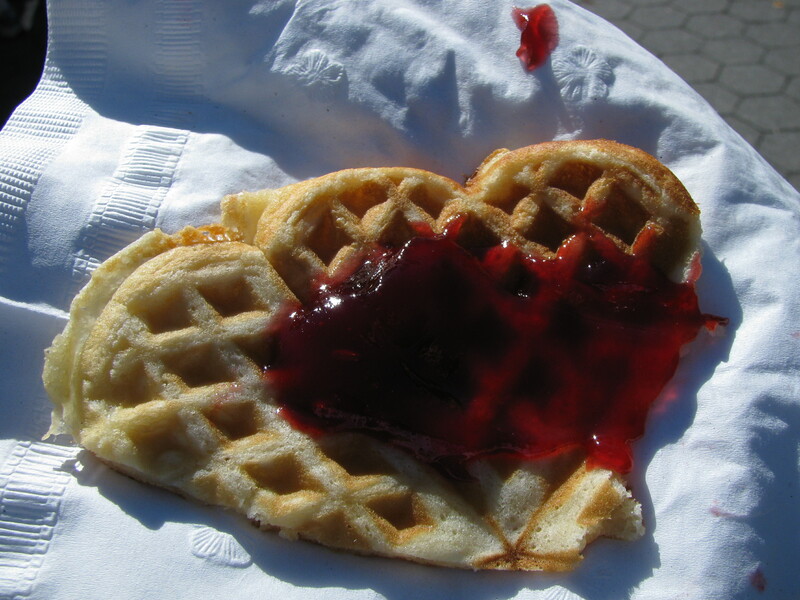 Meanwhile Shamala and her friend and colleague Robbin commiserated over the fact that the freshly made waffles, a signature treat in previous years, were nowhere to be found. We missed the waffles this year. This entry was posted in New York, Races, Running and tagged central park, Grete's Great Gallop, Warren Street Social and Athletic Club. Bookmark the permalink.